It is widely accepted that commodities have two prices: a cash price and a different price if payment is deferred to some later time. Delayed payment for a real estate investment acquisition can involve many individual terms, such as loan-to-value ratio (LTV), interest rate, and term. Woven into this are assumptions the investor must make about the future, such as growth rate and discount rate. 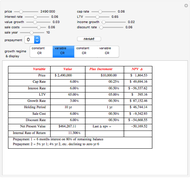 This Demonstration shows the most common variables and produces a net present value for each set. The third column provides an increment of positive change in that variable. The last output (right column) in the grid is the net present value (NPV) of the change in that variable after an up increment. Thus, the user desiring to know how much price difference a particular relaxation of terms may be worth can make that change and see the net present value difference, all else remaining constant. In the lower-right cell the change from the last NPV is shown. The interplay of all the variables can, under the right set of conditions, have a canceling effect. The increase in one variable can be offset by a decrease (or increase) in another variable, which is the point of the price-terms tradeoff. Having in mind a value for each change can improve decision making. Notice what appears to be an anomaly: when price increases, NPV also increases. This, however counterintuitive, is the result of an assumption that capitalization rate is constant over the holding period (the "Constant CR" option). For this to be possible, growth must occur on both income and value at the same rate. 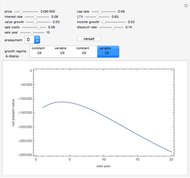 The alternate assumption, that different growth rates apply to value and income, produces capitalization rates that vary over time ("Variable CR" option) and results in NPV change depending on the relative direction and magnitudes of the different growth rates. 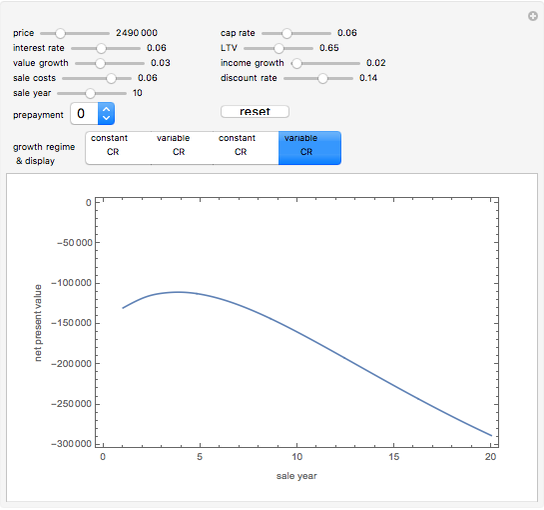 This Demonstration shows the value, in terms of NPV, of incremental changes in negotiated variables. Following that purpose, one can use the sliders to learn about scale and direction. For instance, the default values show that a 5% change in LTV produces a trivial difference in NPV, while a change of one-tenth of that amount on the projected growth rate has a very substantial effect. Not surprisingly, the direction of NPV change is the opposite for interest rate and cap rate. It may be more helpful to know that, at the default values, a change of capitalization rate of roughly half the change in interest rate is nearly offsetting. There are some comforting results to be found. 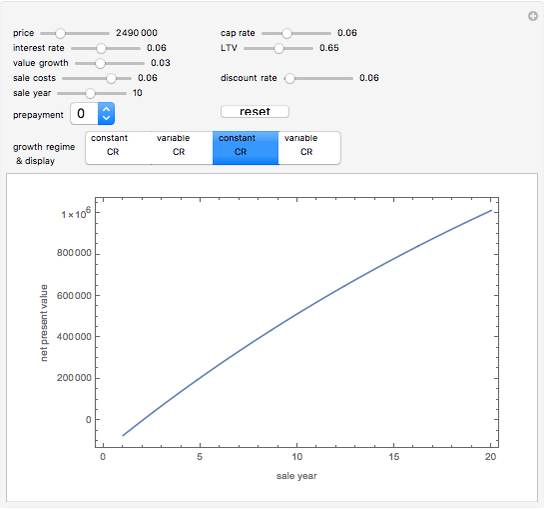 Here are three examples: First, when the computed internal rate of return is less than the pre-specified discount rate, the net present value is, as expected, negative. Second, setting the income growth lower than the value growth over time and a high initial capitalization rate (which is the point value of the ratio of income to value at the time of purchase) produces, as expected, high net present values. This is the mathematical representation of the investment strategy that always works: buy low and sell high. Third, one can model the opposite, choose either graphic view and move the initial discount rate to the right to show the disastrous results arising from owning during a time when rates are moving in the wrong direction. There is also a comment to be made about linearity. 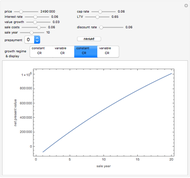 While some forms of NPV may be linear, in general NPV is not linear in each variable. Thus, note that moving the slider for capitalization rate reflects a constant NPV change for each increment of capitalization rate change. 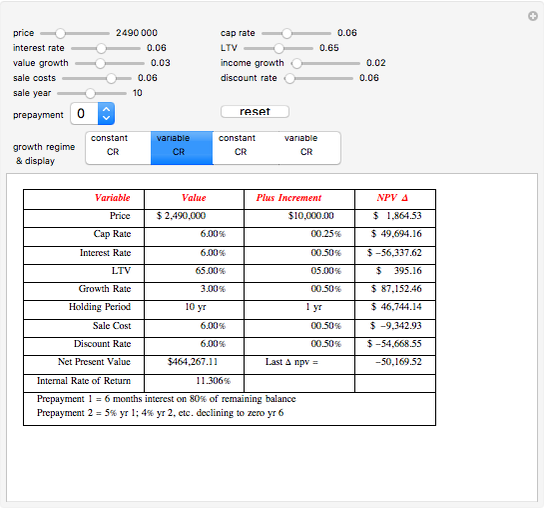 Also note that three other variables—interest rate, LTV, and sale cost—have constant change values at all levels of capitalization rate within the range of this Demonstration. Roger J. Brown "The Price-Terms Tradeoff"